“During each of the fist two courses in 2014 and 2015 we invited about twelve colleagues to make presentations. For the third course we’ve looked for ways to increase interactions among course participants and to give some of our course partners the opportunity to share their experiences with us. We’ve therefore invited additional colleagues to make brief presentations about new trends in geotechnical and structural monitoring. We’re excited that eleven of them have accepted our invitation, and believe that this will very much increase the value of the 2016 course. 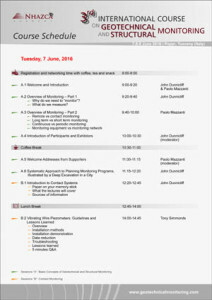 Three sessions will be devoted to these presentation – an outline is showed below. Multiparametric and in place, the geotechnical continous monitoring with DMS columns. Water discharge measurements at Three Gorges Test Dam with the MetaSensing’s FastGBSAR. Innovation in GPS technology for geotechnical monitoring applications. “Photomonitoring”: A cost effective tool for geotechnical and structural monitoring. MOSE and ENI Projects – Submarine Hydraulic Profile Gauge. Wireless sensors for the monitoring of Geotechnical and Civil infrastructure. Metro C Line. New Web GIS Remote Monitoring System for the Hystorical heritage of Rome – monitoring the Coliseum.